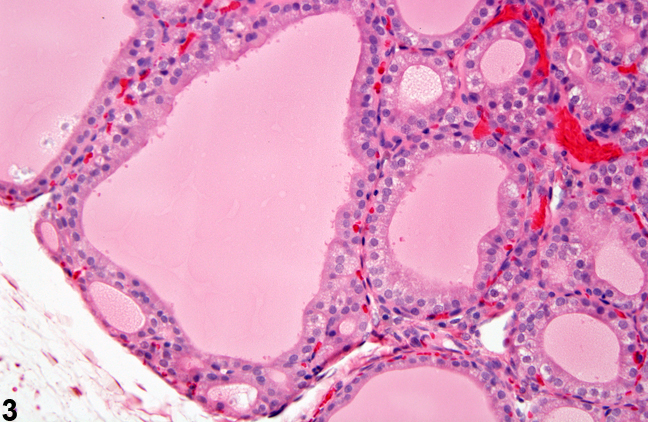 Thyroid Gland, Follicular Cell - Hypertrophy in a male F344/N rat from a subchronic study. Focal hyperplasia is present in two adjacent follicles (arrows). 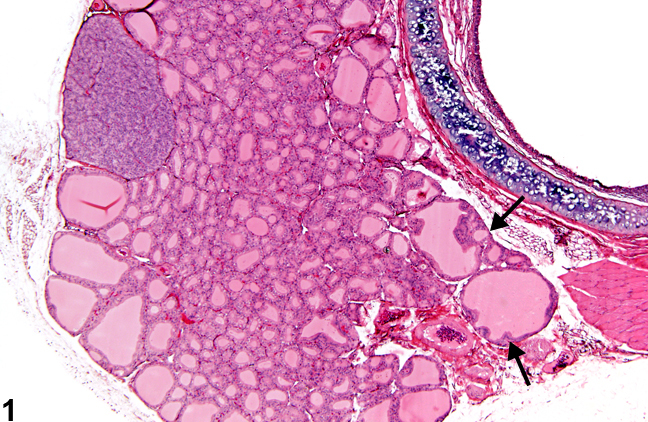 Thyroid Gland, Follicular Cell - Hypertrophy in a male F344/N rat from a subchronic study. Higher magnification of Figure 1 shows the epithelium lining the follicles is cuboidal to columnar. Thyroid Gland, Follicular Cell - Hypertrophy in a male F344/N rat from a subchronic study. The cuboidal to columnar lining epithelium contains small, clear, cytoplasmic vacuoles. 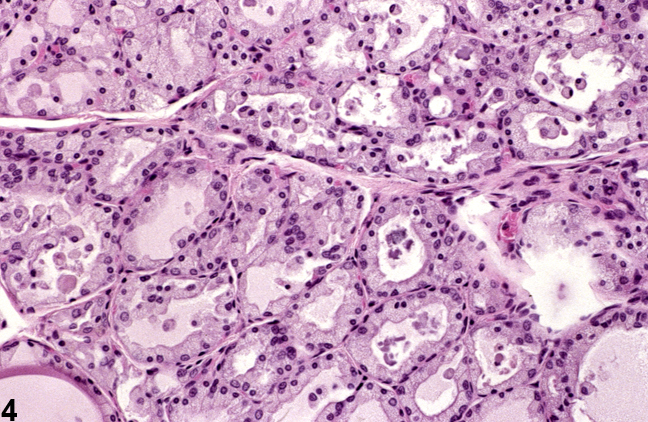 Thyroid Gland, Follicular Cell - Hypertrophy in a female Sprague-Dawley rat from a chronic study. Follicles are smaller than normal, are lined by cuboidal epithelium, and contain amphophilic, flocculant-appearing material and exfoliated epithelial cells. In follicular cell hypertrophy, thyroid follicles may be lined by cuboidal to columnar epithelium with central follicles tightly packed and smaller than normal ( Figure 1 and Figure 2 ). 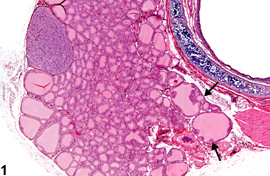 Focal hyperplasia of follicular epithelium may sometimes accompany follicular hypertrophy ( Figure 1 , arrows). Bilateral hypertrophy is expected as a systemic response to increased pituitary secretion of thyroid-stimulating hormone. 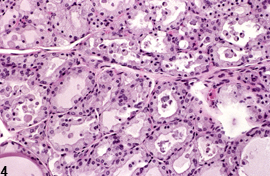 Hypertrophic follicular epithelium may contain pale eosinophilic cytoplasm and small clear vacuoles ( Figure 3 ). In more chronic follicular epithelial hypertrophy, all follicles may be smaller than normal, with secretory depletion or abnormal secretion and exfoliated epithelium ( Figure 4 ). The presence of thyroid follicular cell hypertrophy may be secondary to hepatocellular microsomal enzyme induction, and hepatocellular hypertrophy is often seen concomitantly in rats with thyroid gland follicular cell hypertrophy. 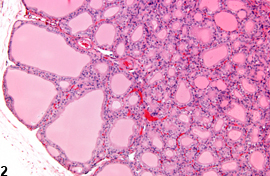 Thyroid follicular cell hypertrophy should be diagnosed and graded when present. The pathology narrative can describe the nature of the hypertrophic follicular epithelium and whether bilateral, accompanied by follicular hyperplasia, or associated with alterations in colloid. Hood A, Hashmi R, Klaassen CD. 1999. Effects of microsomal enzyme inducers on thyroid-follicular cell proliferation, hyperplasia, and hypertrophy. Toxicol Appl Pharmacol 160:163-170. Stevens JT. 1985. Effect of chemicals on the thyroid gland. In: Endocrine Toxicology (Thomas JA, Korach KS, McLachlan JA, eds). Raven Press, New York, 135–147.